Though there are some software developers throughout Canada known for providing more than a dozen different variations of blackjack, Rival focuses more on quality than quantity. 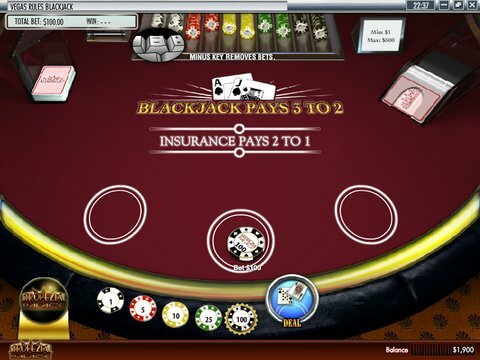 You can discover that for yourself when you check out the blackjack free play demo that is available right here on this page with no download and no registration required. Here, you can use your computer or just about any modern mobile device to access the classic game of 21, learn how to play, practice strategies, and even enhance your betting system - all without risking a dime. The standard game of blackjack that is offered by Rival boasts traditional rules that favor the player more than the casino, and that's why so many people prefer it. Insurance is always on offer here, and you can split up to three times per hand. You'll only be able to split Aces once, and you can double down on your first two cards without any restrictions involved at all. It's a six-deck game with a reshuffle between each hand, you can double after a split, and the dealer is required to hit on soft 17 - a rule that every player can appreciate. The betting range here is quite nice, too, with limits from $1 to $200. Rival also offers a unique multi-hand version in which you can play several hands against the dealer's single hand. Here, it's possible to wager up to $1500 in a single go. Remember, though: these are free play variations. They're perfect for anyone who is knew to blackjack, whether online or in the casino, and they also provide the perfect opportunity to learn various strategies for playing the classic casino game. Rival provides several customizable options, too, including the ability to adjust independent volume controls and change the speed of gameplay. Check out this and other great offers in Canada right here at Grizzly Gambling.